Dhania powder - 1/2 tsp. Jeera powder - 1/4 tsp. Peel and dice potatoes into big cubes. Chop ladiesfinger into 1" long pieces. Heat oil in a kadai, and fry both separately. Keep aside. In the same kadai, heat a tablespoon of oil and add cumin seeds and turmeric powder. (Add the onions at this stage and saute till translucent). Add salt, all the powders and the fried vegetables. Saute well till crispy and golden brown. Tastes heavenly with phulkas , chappatis & pooris. Fantastic combination...curry looks absolutely divine.. Thanks for sharing this simple and quick recipe . I'm amazed by the varieties that your blog offers. Will keep coming here for more. wow! 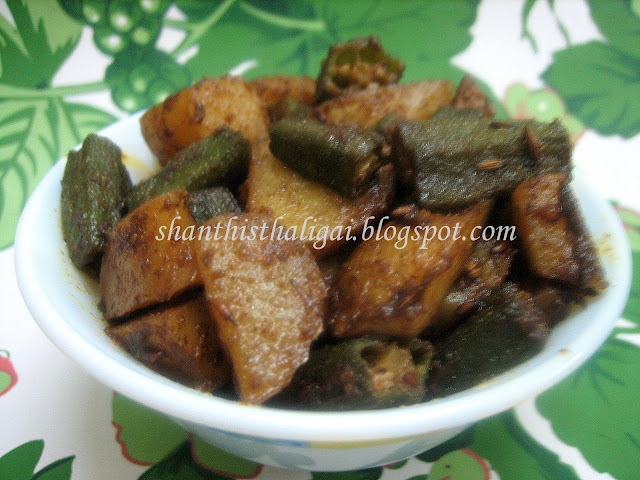 lovely combo of potatoes and lady's finger.looks delicious. Wow thats lovely combo.. looks well roasted and yummy..
Looks nicely roasted - and very tasty! Wish i can have this now! My fav bindi masala!Looks very appetising. I have tagged you in the following. Take it up. yummy combo. curry looks super delicious. Extremely a different combo..I'v always thought that Bhindi won't go together with any veggie..but this looks yummy as well simple..love to make this right now.. This looks delicious! U love the combination of potatoes and okra- Thanks for sharing your fantastic recipe! And thanks for visiting KO Rasoi :) I look forward to following you!